Gordian I (Latin: Marcus Antonius Gordianus Sempronianus Romanus Africanus; c. 159 – 12 April 238) was Roman Emperor for one month with his son Gordian II in 238, the Year of the Six Emperors. Caught up in a rebellion against the Emperor Maximinus Thrax, he was defeated by forces loyal to Maximinus before committing suicide. Little is known on the early life and family background of Gordian. There is no reliable evidence on his family origins. His family were of Equestrian rank, who were modest and very wealthy. Gordian was said to be related to prominent senators. His praenomen and nomen Marcus Antonius suggest that his paternal ancestors received Roman citizenship under the Triumvir Mark Antony, or one of his daughters, during the late Roman Republic. Gordian’s cognomen ‘Gordianus’ suggests that his family origins were from Anatolia, especially Galatia and Cappadocia. According to the Augustan History, his mother was a Roman woman called Ulpia Gordiana and his father Roman Senator Maecius Marullus. While modern historians have dismissed his father's name as false, there may be some truth behind the identity of his mother. Gordian's family history can be guessed through inscriptions. The name Sempronianus in his name may indicate a connection to his mother or grandmother. In Ankara Turkey, a funeral inscription has been found that names a Sempronia Romana, daughter of a named Sempronius Aquila (an imperial secretary). Romana erected this undated funeral inscription to her husband (whose name is lost) who died as a praetor-designate. Gordian might have been related to the gens Sempronia. French historian Christian Settipani gives as his parents Marcus Antonius (b. ca 135), tr. pl., praet. des., and wife Sempronia Romana (b. ca 140), daughter of Titus Flavius Sempronius Aquila (b. ca 115), Secretarius ab epistulis Graecis, and wife Claudia (b. ca 120), daughter of an unknown father and wife Claudia Tisamenis (b. ca 100), sister of Herodes Atticus. It seems therefore that the person who was related to Herodes Atticus was Gordian I's mother or grandmother and not his wife. Also according to the Augustan History, his wife was a Roman woman called Fabia Orestilla, born circa 165, whom the Augustan History claims was a descendant of Roman Emperors Antoninus Pius and Marcus Aurelius through her father Fulvus Antoninus. Modern historians have dismissed this name and her information as false. With his wife, Gordian had at least two children: a son of the same name (Gordian II) and a daughter, Antonia Gordiana (who was the mother of the future Emperor Gordian III). His wife died before 238. Christian Settipani gives as her parents Marcus Annius Severus, who was a Suffect Consul, and wife Silvana, born circa 140, daughter of Lucius Plautius Lamia Silvanus and wife Aurelia Fadilla, daughter of Antoninus Pius and wife Annia Galeria Faustina or Faustina the Elder. Gordian climbed the hierarchy until he entered the Roman Senate. His political career started relatively late in his life and probably his early years were spent in rhetoric and literary studies. As a military man, Gordian commanded the Legio IIII Scythica when the legion was stationed in Syria. He served as governor of Roman Britain in 216 and was a Suffect Consul sometime during the reign of Elagabalus. Inscriptions in Roman Britain bearing his name were partially erased suggesting some form of imperial displeasure during this role. While he gained unbounded popularity by the magnificent games and shows he produced as aedile, his prudent and retired life did not excite the suspicion of Caracalla, in whose honour he wrote a long epic poem called Antoninias. Gordian certainly retained his wealth and political clout during the chaotic times of the Severan dynasty, which suggest his personal dislike for intrigue. Philostratus dedicated his work Lives of the Sophists to either him or his son, Gordian II. During the reign of Alexander Severus, Gordian (who was by then in his late sixties), after serving his suffect consulship prior to 223, drew lots for the proconsular governorship of the province of Africa Proconsularis which he assumed in 237. However, prior to the commencement of his promagistrature, Maximinus Thrax killed Emperor Alexander Severus at Moguntiacum in Germania Inferior and assumed the throne. Maximinus was not a popular emperor and universal discontent roused by his oppressive rule culminated in a revolt in Africa in 238. 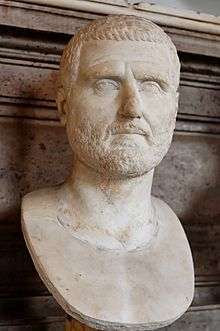 The trigger was the actions of Maximinus’s procurator in Africa, who sought to extract the maximum level of taxation and fines possible, including falsifying charges against the local aristocracy. A riot saw the death of the procurator, after which they turned to Gordian and demanded that he accept the dangerous honor of the imperial throne. Gordian, after protesting that he was too old for the position, eventually yielded to the popular clamour and assumed both the purple and the cognomen Africanus on March 22. An iniquitous sentence had been pronounced against some opulent youths of [Africa], the execution of which would have stripped them of far the greater part of their patrimony. (…) A respite of three days, obtained with difficulty from the rapacious treasurer, was employed in collecting from their estates a great number of slaves and peasants blindly devoted to the commands of their lords, and armed with the rustic weapons of clubs and axes. The leaders of the conspiracy, as they were admitted to the audience of the procurator, stabbed him with the daggers concealed under their garments, and, by the assistance of their tumultuary train, seized on the little town of Thysdrus, and erected the standard of rebellion against the sovereign of the Roman empire. (...) Gordianus, their proconsul, and the object of their choice [as emperor], refused, with unfeigned reluctance, the dangerous honour, and begged with tears that they should suffer him to terminate in peace a long and innocent life, without staining his feeble age with civil blood. Their menaces compelled him to accept the Imperial purple, his only refuge indeed against the jealous cruelty of Maximin (...). Due to his advanced age, he insisted that his son, Marcus Antonius Gordianus (Gordian II), be associated with him. A few days later, Gordian entered the city of Carthage with the overwhelming support of the population and local political leaders. Meanwhile, in Rome, Maximinus' praetorian prefect was assassinated and the rebellion seemed to be successful. Gordian in the meantime had sent an embassy to Rome, under the leadership of Publius Licinius Valerianus, to obtain the Senate’s support for his rebellion. The senate confirmed the new emperor on 2 April and many of the provinces gladly sided with Gordian. Opposition would come from the neighbouring province of Numidia. Capelianus, governor of Numidia, loyal supporter of Maximinus Thrax, and who held a grudge against Gordian, renewed his alliance to the former emperor and invaded Africa province with the only legion stationed in the region, III Augusta, and other veteran units. Gordian II, at the head of a militia army of untrained soldiers, lost the Battle of Carthage and was killed, and Gordian took his own life by hanging himself with his belt. The Gordians had reigned only thirty-six days. Gordian had deserved his high reputation by his amiable character. Both he and his son were men reported to be fond of literature and achieved great accomplishments, publishing voluminous works. But they were more interested in intellectual pursuits, possessing neither the necessary skills nor the resources to be considered able statesmen or powerful rulers. Having embraced the cause of Gordian, the senate was obliged to continue the revolt against Maximinus, and appointed Pupienus and Balbinus, as joint emperors. Nevertheless, by the end of 238, the recognised emperor would be Gordian III, his grandson. Gordian and his son were deified by the Senate. 1 2 3 4 Settipani, "Continuité gentilice et continuité sénatoriale dans les familles sénatoriales romaines à l'époque impériale"
Wikimedia Commons has media related to Gordianus I.